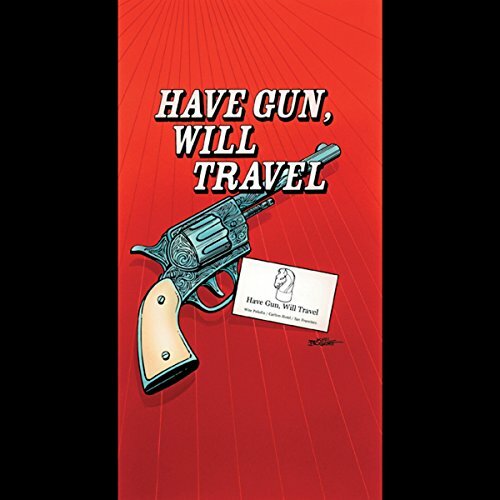 Showing results by author "Have Gun Will Travel"
Have Gun - Will Travel was already a hit on television when it made its CBS Radio debut in in 1958. John Dehner starred as the mysterious, cultured gunfighter known only as Paladin. He lived in a San Francisco hotel, dressed in black, left calling cards, and used the chess knight as his symbol. More than 100 episodes were broadcast before the program went off the air in 1960. This episode originally aired on June 28, 1959. Have Gun - Will Travel was already a hit on television when it made its CBS Radio debut in in 1958. John Dehner starred as the mysterious, cultured gunfighter known only as Paladin. He lived in a San Francisco hotel, dressed in black, left calling cards, and used the chess knight as his symbol. More than 100 episodes were broadcast before the program went off the air in 1960. This episode originally aired on December 14, 1958. Have Gun - Will Travel was already a hit on television when it made its CBS Radio debut in in 1958. John Dehner starred as the mysterious, cultured gunfighter known only as Paladin. He lived in a San Francisco hotel, dressed in black, left calling cards, and used the chess knight as his symbol. More than 100 episodes were broadcast before the program went off the air in 1960. This episode originally aired on July 3, 1960. Have Gun - Will Travel was already a hit on television when it made its CBS Radio debut in in 1958. John Dehner starred as the mysterious, cultured gunfighter known only as Paladin. He lived in a San Francisco hotel, dressed in black, left calling cards, and used the chess knight as his symbol. More than 100 episodes were broadcast before the program went off the air in 1960. This episode originally aired on January 3, 1960. Have Gun - Will Travel was already a hit on television when it made its CBS Radio debut in in 1958. John Dehner starred as the mysterious, cultured gunfighter known only as Paladin. He lived in a San Francisco hotel, dressed in black, left calling cards, and used the chess knight as his symbol. More than 100 episodes were broadcast before the program went off the air in 1960. This episode originally aired on November 22, 1959. Have Gun - Will Travel was already a hit on television when it made its CBS Radio debut in in 1958. John Dehner starred as the mysterious, cultured gunfighter known only as Paladin. He lived in a San Francisco hotel, dressed in black, left calling cards, and used the chess knight as his symbol. More than 100 episodes were broadcast before the program went off the air in 1960. This episode originally aired on December 21, 1958. Have Gun - Will Travel was already a hit on television when it made its CBS Radio debut in in 1958. John Dehner starred as the mysterious, cultured gunfighter known only as Paladin. He lived in a San Francisco hotel, dressed in black, left calling cards, and used the chess knight as his symbol. More than 100 episodes were broadcast before the program went off the air in 1960. This episode originally aired on July 5, 1959. Have Gun - Will Travel was already a hit on television when it made its CBS Radio debut in in 1958. John Dehner starred as the mysterious, cultured gunfighter known only as Paladin. He lived in a San Francisco hotel, dressed in black, left calling cards, and used the chess knight as his symbol. More than 100 episodes were broadcast before the program went off the air in 1960. This episode originally aired on December 27, 1959. Have Gun - Will Travel was already a hit on television when it made its CBS Radio debut in in 1958. John Dehner starred as the mysterious, cultured gunfighter known only as Paladin. He lived in a San Francisco hotel, dressed in black, left calling cards, and used the chess knight as his symbol. More than 100 episodes were broadcast before the program went off the air in 1960. This episode originally aired on February 15, 1959. Have Gun - Will Travel was already a hit on television when it made its CBS Radio debut in in 1958. John Dehner starred as the mysterious, cultured gunfighter known only as Paladin. He lived in a San Francisco hotel, dressed in black, left calling cards, and used the chess knight as his symbol. More than 100 episodes were broadcast before the program went off the air in 1960. This episode originally aired on February 22, 1959. Have Gun - Will Travel was already a hit on television when it made its CBS Radio debut in in 1958. John Dehner starred as the mysterious, cultured gunfighter known only as Paladin. He lived in a San Francisco hotel, dressed in black, left calling cards, and used the chess knight as his symbol. More than 100 episodes were broadcast before the program went off the air in 1960. This episode originally aired on January 17, 1960. Have Gun - Will Travel was already a hit on television when it made its CBS Radio debut in in 1958. John Dehner starred as the mysterious, cultured gunfighter known only as Paladin. He lived in a San Francisco hotel, dressed in black, left calling cards, and used the chess knight as his symbol. More than 100 episodes were broadcast before the program went off the air in 1960. This episode originally aired on April 19, 1959. Have Gun - Will Travel was already a hit on television when it made its CBS Radio debut in in 1958. John Dehner starred as the mysterious, cultured gunfighter known only as Paladin. He lived in a San Francisco hotel, dressed in black, left calling cards, and used the chess knight as his symbol. More than 100 episodes were broadcast before the program went off the air in 1960. This episode originally aired on July 10, 1960. Have Gun - Will Travel was already a hit on television when it made its CBS Radio debut in in 1958. John Dehner starred as the mysterious, cultured gunfighter known only as Paladin. He lived in a San Francisco hotel, dressed in black, left calling cards, and used the chess knight as his symbol. More than 100 episodes were broadcast before the program went off the air in 1960. This episode originally aired on November 8, 1959. Have Gun - Will Travel was already a hit on television when it made its CBS Radio debut in in 1958. John Dehner starred as the mysterious, cultured gunfighter known only as Paladin. He lived in a San Francisco hotel, dressed in black, left calling cards, and used the chess knight as his symbol. More than 100 episodes were broadcast before the program went off the air in 1960. This episode originally aired on January 10, 1960. Have Gun - Will Travel was already a hit on television when it made its CBS Radio debut in in 1958. John Dehner starred as the mysterious, cultured gunfighter known only as Paladin. He lived in a San Francisco hotel, dressed in black, left calling cards, and used the chess knight as his symbol. More than 100 episodes were broadcast before the program went off the air in 1960. This episode originally aired on February 21, 1960. Have Gun - Will Travel was already a hit on television when it made its CBS Radio debut in in 1958. John Dehner starred as the mysterious, cultured gunfighter known only as Paladin. He lived in a San Francisco hotel, dressed in black, left calling cards, and used the chess knight as his symbol. More than 100 episodes were broadcast before the program went off the air in 1960. This episode originally aired on April 24, 1960. Have Gun - Will Travel was already a hit on television when it made its CBS Radio debut in in 1958. John Dehner starred as the mysterious, cultured gunfighter known only as Paladin. He lived in a San Francisco hotel, dressed in black, left calling cards, and used the chess knight as his symbol. More than 100 episodes were broadcast before the program went off the air in 1960. This episode originally aired on November 15, 1959. Have Gun - Will Travel was already a hit on television when it made its CBS Radio debut in in 1958. John Dehner starred as the mysterious, cultured gunfighter known only as Paladin. He lived in a San Francisco hotel, dressed in black, left calling cards, and used the chess knight as his symbol. More than 100 episodes were broadcast before the program went off the air in 1960. This episode originally aired on May 1, 1960.